Juliet Swann works as the Campaigns and Research Officer for the Electoral Reform Society in Scotland. The ERS are planning an exciting series of events to get the debate about Scotland’s democracy away from the politicians and into the hands of the people. This isn’t just a conversation about independence, it’s about what’s wrong with politics and how we can fix it, a topic Juliet blogs on below. Maybe our democracy never really worked that well. Maybe increased transparency and developments in technology mean that ordinary people are able to appreciate the realities of power and its misuse. Maybe the modern age has seen an erosion of values such as public service and civic duty that have led to a loss of trust in politics. Whatever the reasons, the truth is that trust in politics and democracy is ebbing away. The independence referendum presents an exciting opportunity for Scotland to consider her democracy. Fifteen years after the devolution referendum, are the objectives of that poll being met, and are there other aspects of our democratic systems that could stand a spring clean. To try and take a temperature check of what the Scottish public think about how politics is working for them, ERS Scotland is looking for people from across the country to join a unique day long gathering in Edinburgh in mid-July. The ‘People’s Gathering’ will bring together 129 ‘Members of the Scottish Public’ for a Saturday to share and debate their views on our democracy. We are not making a judgement on the pros and cons of independence, or any other interim position but we do think the current discussion should be as democratic and open and informed as possible and should engage as many Scots as possible. Discussing democracy, devolution and our constitution is part of a healthy functioning democracy, and should be welcomed, and engaged with, not feared or discouraged. So what might this conversation about the constitution include? Issues range from the practicalities of matters of state like currency and defence, international issues like membership of NATO and the EU, day-to-day policy issues like welfare and benefits, and then the plain ridiculous questions such as what will happen to the Edinburgh Zoo pandas. At the Electoral Reform Society Scotland our contention is that regardless of your thoughts on these or any other particular issues, this is an opportunity to put systems in place that mean we can have more confidence in how the issues facing Scotland’s democratic future are decided. A functioning democracy requires a certain number of conditions, reviewing their functionality every so often can indicate weaknesses, failings, or fractures. Especially considering the warning signs – low turnout, cynicism about politics, accusations of corruption. What should we do about turnout in elections? We know people engage with charities and community groups who work for change at a local and national level, why don’t those people feel engaged with the system of government? 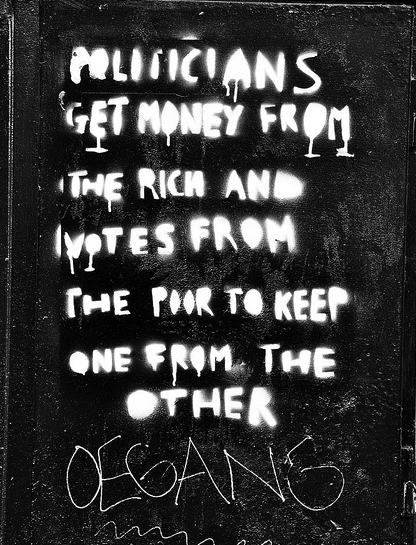 Is politics really representing the people? Does our parliament resemble our society? How much should it do so? Obviously our elected representatives need to have a certain skillset, but how much confidence can we have in our Government’s ability to make fair decisions when there are more millionaires than women in the Westminster cabinet? Do politicians need to be more accountable to the people? Is a law of recall too blunt an instrument? Certainly the American experience suggests it can be abused by interest groups, so do we need to think of a more holistic way of ensuring accountability? Are big banks and newspaper editors too powerful in influencing policy? The Leveson Inquiry is revealing that corporations and their representatives have more access to Government than we do. In and of itself that may simply be a result of their size, but if they are able to direct policy decisions to their benefit rather than in the best interests of the country and the population, then that needs to be addressed. And that’s just scratching the surface. The opportunity we have at the moment is the chance to re-imagine what we want politics to look like, what we want it to achieve. We can challenge those involved in the discussion about yes or no to independence to tell us what they would or wouldn’t change, what are they going to do with this opportunity to engage with the Scottish people and talk about how we are governed. That’s exciting. I’m going to apply. What an interesting conversation that will be. Hope there is a good diverse selection. As you say, scratching the surface and areas of discussion about what we mean by devolution (ie not just to Holyrood), sly tricks to avoid transparency by out-sourcing and other occur but the most valuable exercise is questioning the givens. For instance, the last few days have seen a non-debate on the constitution with folk against the monarchical institution getting the response of ‘cynic’ ‘grumpy’ ‘disloyal’ ‘ungrateful’ (and occasional harsher terms) with the only alternative being seen as the US presidential system. A greater understanding of alternatives, along with the means to critically engage with them, is crucial. One may end up with the same opinion which is fine as there is a difference between an assumption and a coherent, appreciative understanding arrived at by weighing up alternative pros and cons. In the year 2009, eleven years after devolution in Scotland, the Scottish Parliament introduced a consultation document under the National Parks (Scotland) Act 2000 which continues to discriminate against those residing in the Loch Lomond and the Trossachs areas by proposing nothing that reduces a substantial amount of power from the elected local authorities and placing it in the hands of National Park Authorities (NPAs) which are non-departmental public bodies (NDPBs) responsible to central government. This proposal continues the anomaly that those residing within national park boundaries do not enjoy the same level of local democracy as elsewhere in the country, as the 17 NPA board members dominated by central government appointees and board member electees, “must work together with the purpose, as set out in the Act [section 9 (1)], of ensuring that the National Park aims are collectively achieved in relation to the National Park in a coordinated way”. (a) 6 central government appointees. (b)	6 further central government appointees nominated by local councils that have at least part of a ward within the national park boundaries. These nominated board members are generally, but not necessarily, local councillors who have been elected on mainstream issues but who are required to represent their electorate differently, depending whether or not their voters reside within the national parks. They are also entitled to make decisions that affect constituencies in which they do not reside or represent. (c) 5 board member electees who are solely concerned with national park issues. This is passed off as “democracy” but there is a world of a difference between electing local councilors on the wide political front and board members “electees” of quangos with a single-issue remit. Under this proposal, planning applications will still be determined by board members who must work together to ensure that the national park aims are collectively achieved. Board members who are councilors elected on mainstream politics will require to make different decisions depending on whether their constituents do or do not reside within national park boundaries. Why are those who live within the boundaries of national parks in Scotland not entitled to the same level of local democracy as elsewhere in the country? The National Parks (Scotland) Act 2000 is an act of discrimination against a minority of the population based on where they reside.